Copy-star.com - Ζερβάκης Ν. Γεώργιος - Konica c252 color A3 used ελαφρως μεταχ. ΜΗΧΑΝΗΜΑΤΑ +PC +printers ΠΡΟΣΦΟΡΕΣ Live! Main page Konica c252 color A3 used ελαφρως μεταχ. Konica c252 color A3 used ελαφρως μεταχ. ΚΑΙ ... νεα χαμηλότερη τιμη στα γνησια τονερς !! ΕΤΟΙΜΟ ΝΑ εκτυπωσετε 5 εως και 10.000Α4 χωρις αλλαγη υλικων!!!!!!! 1/2 ζωη τυμπανων, 1/2 ποσ. γραφιτη-μελανιων...η και περισσοτερο!!! Παρεχεται Εγγυηση καλης λειτουργιας..12μηνες, ( η με συμβαση ΣΣ+Α ...). 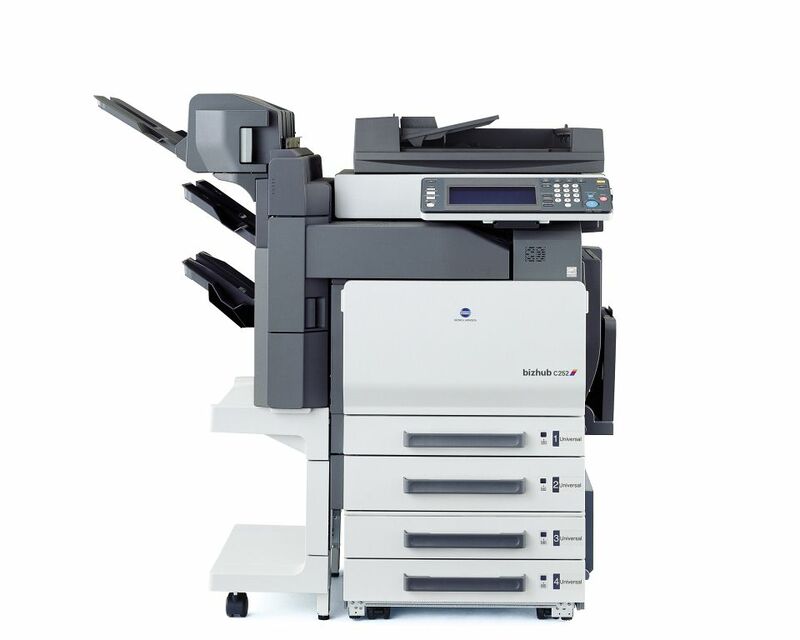 The Konica Minolta bizhub C252 is a standard copier, network printer, and scanner; additional fax options are available to make it an all-in-one workhorse. The bizhub C252 is an excellent choice for large offices. The high monthly duty cycle of 75,000 pages can handle the demands of a busy office. With speeds of up to 25 ppm in both color and monochrome the Konica Minolta bizhub C252 will not slow you down. With the Emperon Print System you can print and scan from your desktop on both Windows and Mac computers. The bizhub C252 has an intelligent bypass which allows for flexible paper handling; including printing on envelopes or coated paper. Standard duplexing and advanced print control allow for you to produce outstanding documents in-house. The Konica Minolta bizhub C252 has the economical design of a larger yielding black imaging unit (IU210K) that will not have to be replaced for an estimated 70,000 pages at 5 percent. Imaging units for cyan (IU210C), magenta (IU210M), and yellow (IU210Y) will yield approximately 45,000 pages at 5 percent. The toners needed for the bizhub C-252 also have a large yielding black cartridge (TN210K) with an estimated 20,000 pages at 5 percent. The cyan (TN210C), magenta (TN210M), and yellow (TN210Y) toner cartridges will yield an estimated 12,000 pages at 5 percent. Each toner cartridge can be purchased in either the genuine Konica Minolta brand or Precision compatible.